So goes tiny Delaware’s favorite claim to fame, aside from the duPont family, and, in some circles, Joe Biden: Delaware was the first to ratify the U.S. Constitution, thereby becoming the first state. But it’s not true. Although it’s true that Delaware was the first state to ratify the Consitution, it had already been a state for eleven years at that point, and it wasn’t the oldest. Rhode Island’s colonial legislature declared independence from Great Britain on May 4, 1776; the legislature of the Three Lower Counties of Pennsylvania, home to more than their fair share of Loyalists, did not follow suit until June 15. This date marks the separation of New Castle, Kent, and Sussex Counties from Pennsylvania as well as Great Britain, and is still remembered and celebrated as Separation Day. The new state adopted a constitution on September 20, 1776, which officially established the name “the Delaware State.” In the following years, life went on. War raged through the colonies. In February 1779, the Delaware State become the next to last to ratify the Articles of Confederation. The war formally ended in 1783, shortly after Delaware had begun its eighth year of statehood. George Washington was revered as a war hero. In Sussex County, the farmers who had opposed independence tilled their fields, their daily lives largely unchanged. Finally, in December 1787, ten delegates from each county met in Dover to consider the proposed federal constitution, which would establish a new national government. The delegates from Sussex County were John Ingram of Broadkill Hundred; John Jones and Israel Holland of Baltimore Hundred; Thomas Laws of Northwest Fork Hundred; Woodman Stockley of Indian River Hundred; John Laws, Jr., of Nanticoke Hundred; Thomas Evans of Cedar Creek Hundred; and William Moore, William Hall, and Isaac Cooper of Little Creek Hundred. 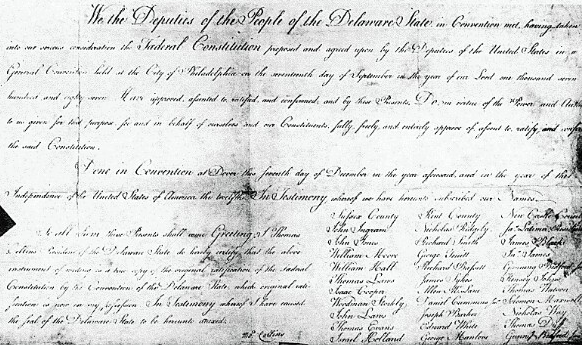 It is this resolution, and its influence upon other states which were debating the proposed Constitution, that should be celebrated on Delaware Day — not Delaware’s statehood, which was already old, old news on December 7, 1787; and not the achievement of becoming the first American state, which Delaware didn’t achieve anyway.